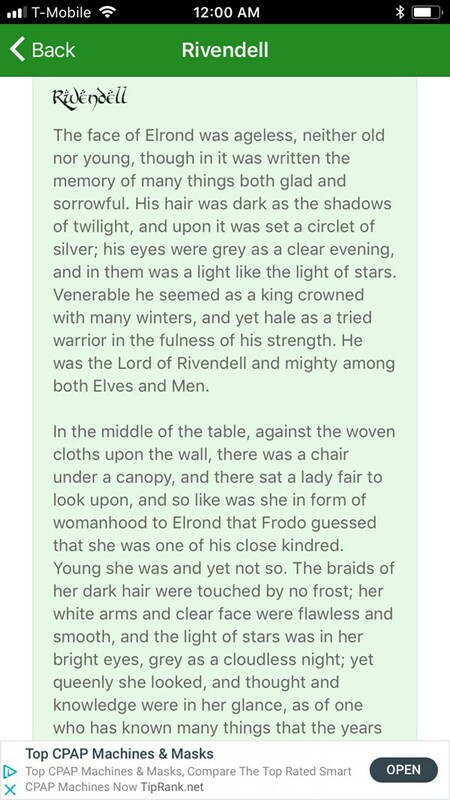 In the Fellowship of the Ring, by J.R.R. 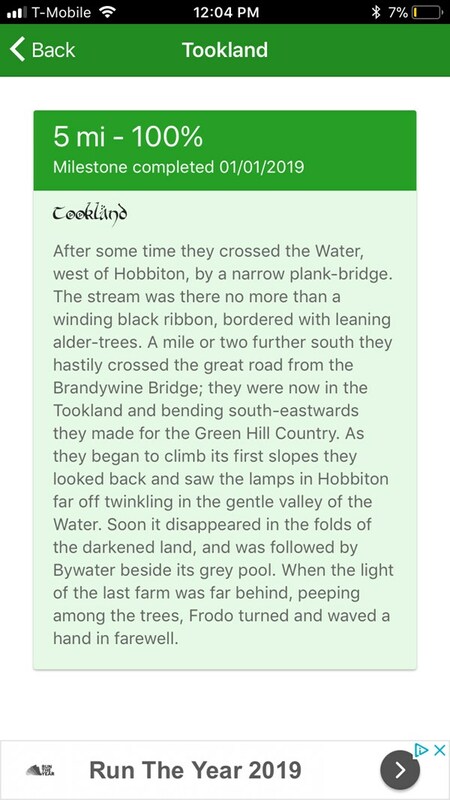 Tolkien, Frodo, Sam, and their companions travel from Bag End in Hobbiton to Rivendell. Our goal is to re-create their walk in our neighborhoods, parks, gyms, homes, and minds. It’s 1779 miles (2863 km) from the Shire to Mordor following Frodo and Sam’s journey. If you walk three miles every other day, it will take you 20 weeks (about 4.5 months) to reach Weathertop and complete your challenge. 906 people want to do this. 14 people have done this. Almost to Weathertop with less than 2 miles to go. I have 1623 miles to Mordor. Obviously a long way to go, but I'm still surprised at how much progress I'm making. It really makes me want to get out and do more. I am between Midgewater Marshes East and Weathertop. Between December 7th and now, I have walked 212.65 miles. I have about 2 years left to walk another 1719.35 miles. Good thing it took the hobbits and dwarves several seasons to walk it, as well! I am at Midgewater Marshes West with only 4.5 miles until I reach the east! 193.5 miles down!!! I am between Bree and the west side of the Midgewater Marshes! (150 miles down 1800 something left) We can do this. Right? THIS IS WHAT I HAVE LOOKED FORWARD TO THE MOST. I COULD QUIT NOW AND BE HAPPY. I'm impressed at how well these are spaced out-- averaging five miles a day, I'm hitting milestones frequently. Someone put a lot of work into this experience. Making good progress, although still over 1800 miles to go. 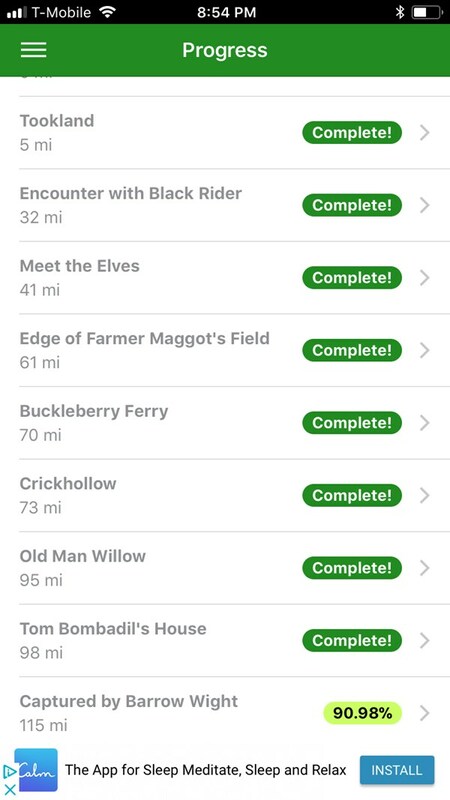 First milestone down-- made it the 5 miles to Tookland and the edge of the Shire. Using 1.6 steps per meter, with the road to Mordor being 2863km. 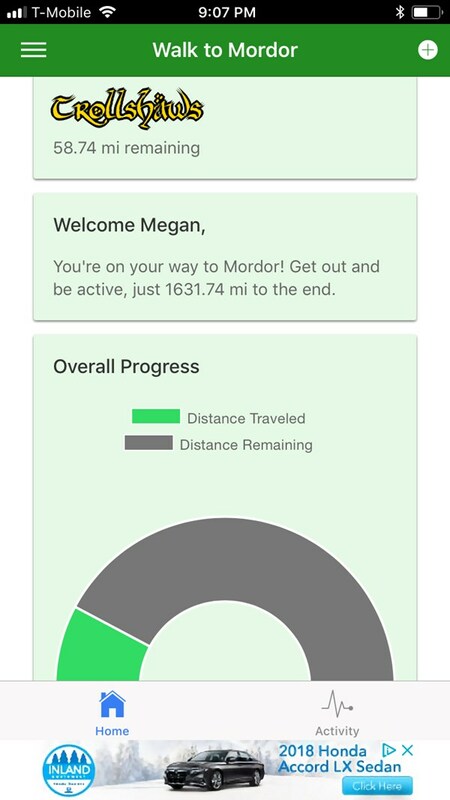 I need to walk 4,580,800 steps to get to Mordor. Or roughly 4.6 million steps. I started counting from November 2018 and now, 19 days in, I've walked 226,304 steps, or 5% of the way. That seems like a great start! Using my Mi Band to keep track (when it works...). In km, I'm a Spaniard. I'm a bit inactive as my job is in front of a computer, but someday I'll get to Mt. Doom! Hobbiton to Rivendell: 737 km (737 total)---> I got to Rivendell! The Ring has been overwhelming me. 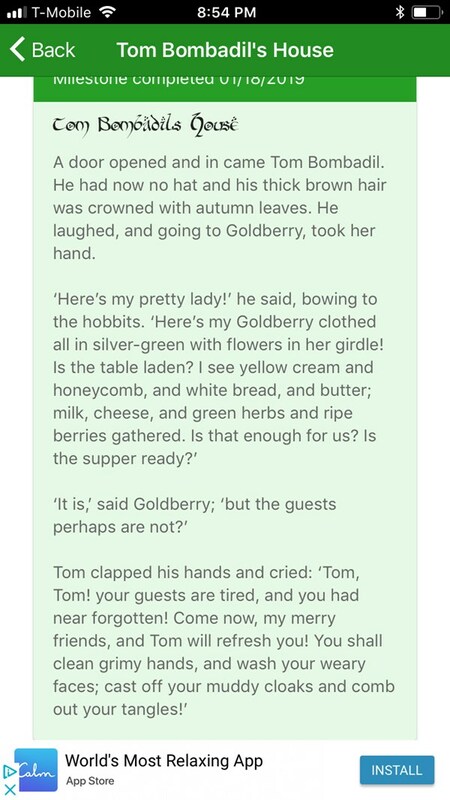 If not for Sam, Merry, and Pip, I don't know if I'd remember anything. 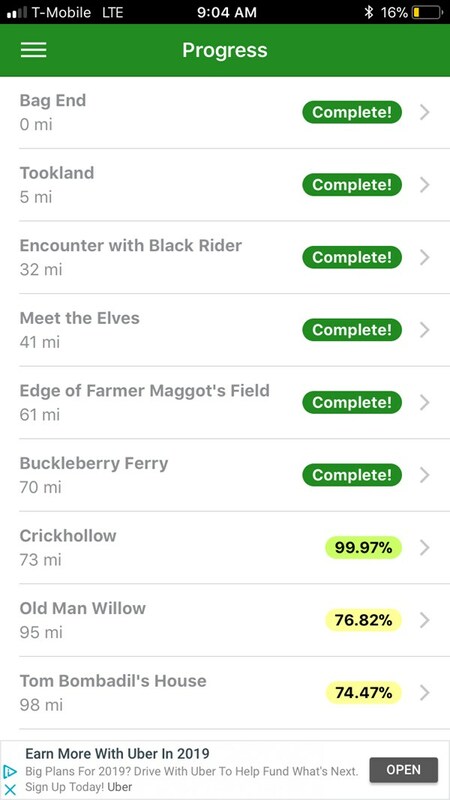 But, Pippin has forgotten to update our journey's log! Sigh. I guess I should have asked Sam, but he does so much already. We have not progressed as much as we had planned. But, little as it is, we have made progress on our way to Rivendell. We're setting off earlier and longer tomorrow. Hope to see you on the way. Pretty steep going right now. Pippin's yawning this last mile has started to make me feel like pitching camp already. But, the moon looks good, so I think maybe we can turn in in a mile or 2. I hope to put some more distance in these next days. 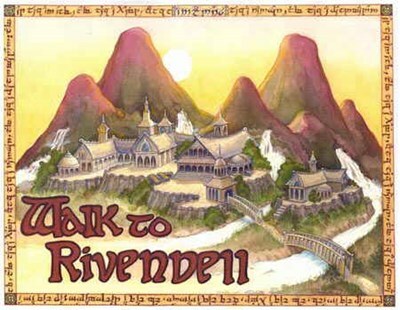 The closer to Rivendell, the closer to home. It took us some time, what with Pippin constantly getting sidetracked with some great-looking mushrooms or a barrow we should explore when we had the chance or soaking in the crisp winter weather (Feb 5-10, 2018) or whatnot, but we finally made it out the gate, over The Water, which was dicey due to my fear of wooden bridges, and across the Great East Road. Hard to see Hobbiton from here. *sigh* I'm going to miss it. But, after a good bit of supper, I think I'll be ready to keep up on this adventure. Just another 446.5 miles to Rivendell! Woohoo! 07/22/17 Ahhh...found a place to cross. South bank is wet and reedy...not fun walking in. Hopefully, I can find a dry spot to camp on. 07/21/17 Cutting southeast cross country to the Buckleberry Ferry. There's a stream here. Think it's the Stock-brook. Sides are really steep, maybe I'll be able to find a place to cross further on. 07/19/17 Found it!!!!! Making camp. Nice view across the river valley. You can see the lights of Woodhall below. 07/18/17 Woods are getting denser. Somewhere around here somewhere is where the guys turned off the path onto a "green ride" whatever that is. Hope I don't miss it. 07/17/17 If I'm following this book correctly, right about here is where the guys saw another Black Rider (or maybe the same one), but he ran away when the elves came through. Wish I could see them...alas they no longer reside in Middle Earth. 07/15/17 Came to a fork in the road. Left goes to Stock, but right looks like a lovely walk through some ancient oaks. 07/12/17 The road has been fairly straight...er, straight to the river. Seeing some odd black hoofprints that seem to be burned into the ground. Remember something about Frodo and the guys running into a Black Rider around these parts. 07/09/17 Finally! Got to the top...and what a view!!!! Totally worth it. Can see all the way across Woody End to the river. At leas, it's downhill from here. 07/08/17 Lots of up and down, up and down. And just when I thought it would get better. A switchback back and forth up the hill. UGH!!!!! 07/07/17 Up and down, up and down. If I was going faster, I'd feel like a jumping rabbit.Good leg workout though. 07/03/17 Just strolled among the trees yesterday. Quite lovely and relaxing. Listening to the birds, smelling the flowers, eating delicious campfire meals. Should've probably ridden ponies like Mr. Frodo...oh, well. This steep hill would've been rough on 'em. Nice little stand of firs just over the top to camp in. 07/01/17 Came upon Stock Rd and followed it. There are some deep tracks here, but the tall trees are quite lovely. 06/30/17 Came across a lovely grove of birch trees. Whiled away the time enjoying nature. Ended up spending the night here...and eating several meals.